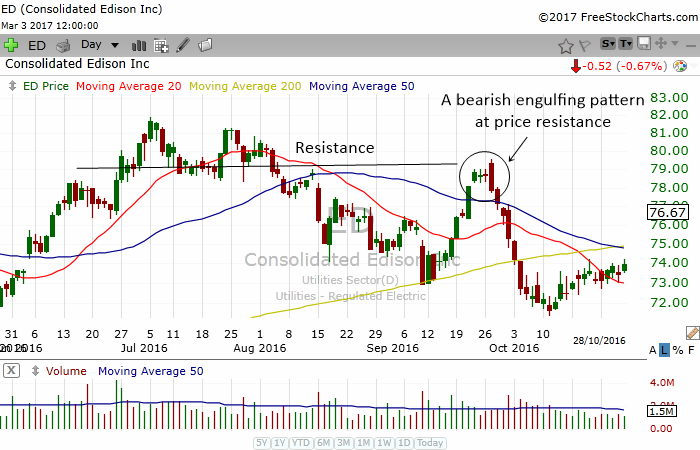 The bearish engulfing pattern is a powerful reversal candlestick pattern that hints of a bearish reversal in a stock. The pattern usually emerges after a nice bullish rally. The presence of the engulfing pattern completely wipes out the bulls and ushers in the bears. 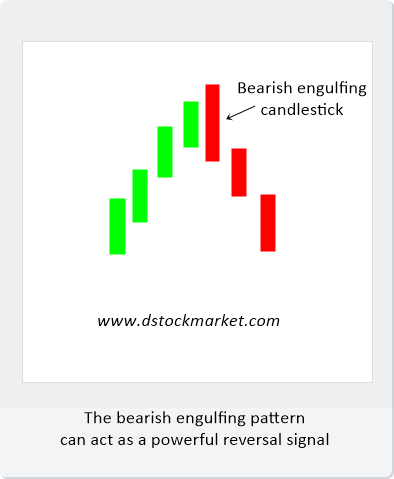 The picture above shows how a bearish engulfing pattern looks like. A stock may rally for a few days and then a large bearish candle appears which completely covers the previous bar. This shows that the bullish run is over and bears are coming in. In the chart of AES above, you can see how this stock had a really nice bullish rally in early December. Then a large red candle appeared which completely engulfs the previous green candle. The presence of the bearish engulfing candle marked the short term top of this stock. 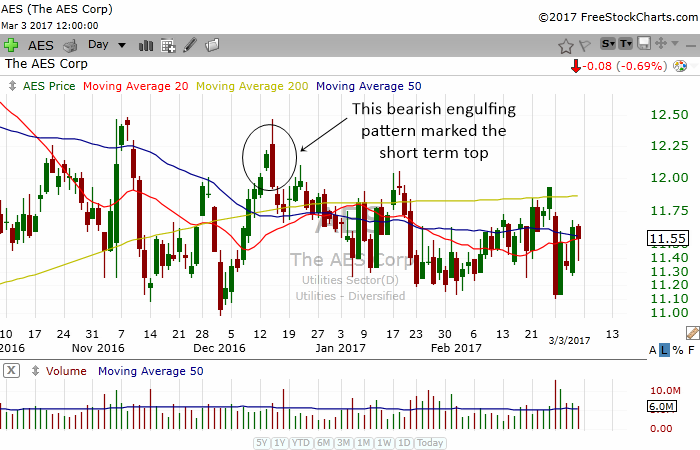 Those who saw this candle pattern emerge and sold their shares would have avoided the long bearish sideways movement in the stock. 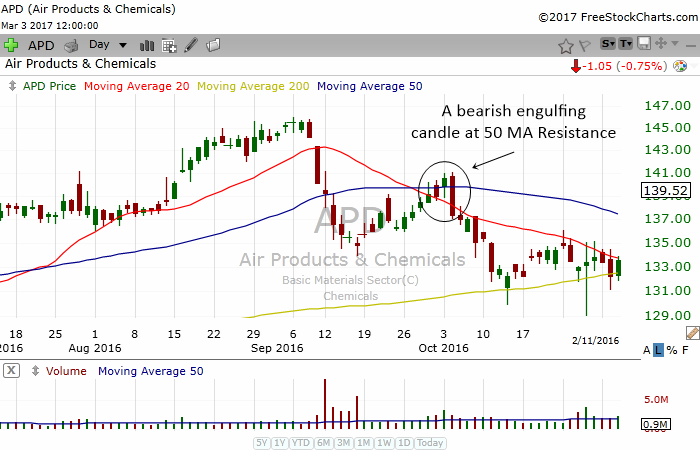 The chart above shows APD formed a bearish engulfing pattern at its 50 day moving average. The 50 MA acted as a resistance. Notice that the stock also had a bearish 50 MA cross 20 MA that hinted of a new downtrend. The presence of a bearish engulfing pattern at the 50 MA and also a bearish cross is a very powerful signal that tells traders they should sell this stock. Look how troubled the stock was. It declined for many days. 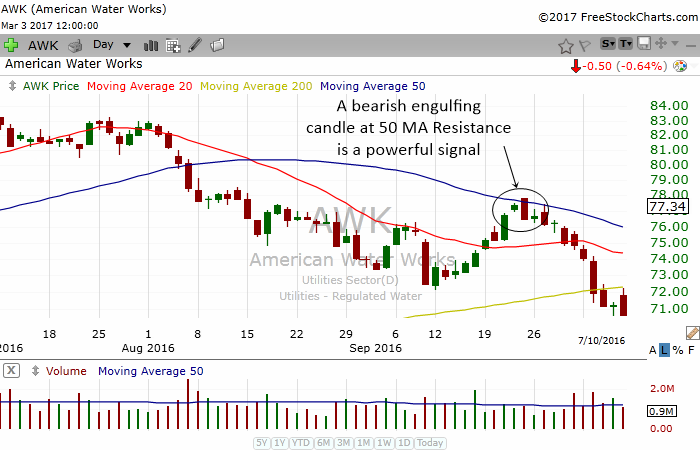 AWK above is another great example of combining the 50 day moving average with candlestick pattern. Notice how a bearish engulfing candle form at exactly the 50 MA. The stock declined rapidly over the next 2 weeks. Traders who saw this signal could have taken a short position and profited from the move. The chart above shows us how the presence of a bearish engulfing pattern at price resistance can act as a powerful reversal signal. You can read more about support and resistance at Support And Resistance In Stocks. The presence of two dojis showed that the stock was losing momentum to the upside. When a bearish engulfing pattern appeared and covered 3 candle bars, it was a powerful signal that told us this stock is ready to fall. Notice how the stock rapidly declined in the next 2 weeks. Japanese Candlesticks offer the trader very potent signals if you combine them with Western indicators. I like to call this a fusion where East meets West to create a powerful trading signal which can generate insane amount of profits for the trader. 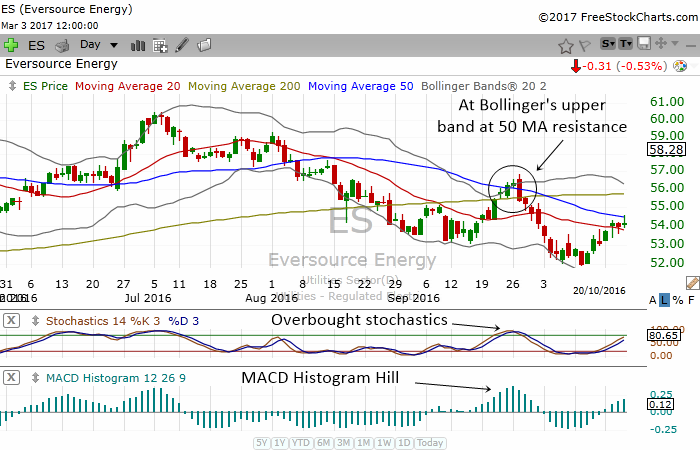 In the chart above of ES, you can see that I have overlayed the moving average, the Bollinger Bands, the stochastics and the MACD. All these indicators are very useful to spot reversal areas. The very first thing that will bring our attention to the stock is of course the bearish engulfing pattern. Then you might notice that the stock was in a downtrend but it rallied a few days right into the 50 day moving average which can act as a powerful psychological resistance. After that, you can bring in the Bollinger Bands and you will notice that the stock price is at the upper band of the Bollinger Bands. This hints of a possible reversal as stock prices often bounce off their upper and lower bands. Next, you look at the stochastics and notice that the indicator is showing an overbought reading and giving us a sell signal. Finally you look at the MACD and notice that the histogram is forming a hill. The moment the histogram contracts, you know that the momentum to the upside has slowed down. The combination of the Japanese candlestick pattern and the various indicators tell us that this stock is setting up a very potent short selling opportunity for the trader. The stock declined rapidly in the coming days and those who took the short trade made excellent profits.